I received a black onesie with an adorable swirly vintage-like duck image on the front for Gareth (who is the destroyer of clothing). 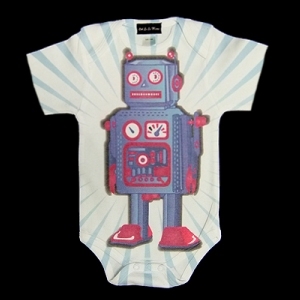 The onesie is made of very soft and durable fabric. It’s nice and thick and the sleeves come down closer to the elbow – as opposed to the cheap, thin onesies that always look like they have cap sleeves which I don’t like on my son. Gareth has done his worst to this garment. It’s been covered in a variety of foods, walked on, ridden over with his trucks and washed numerous times and it still looks like new! They have several other unique and adorable designs all in great colors. Not your typical baby clothing and that is good. I like this product so much that I am considering buying shirts for Lily’s birthday from them.